Phybo is an experimental project about creating simple physical objects that connect and interact with web applications. The idea is to put together physical interaction and web applications and see how they fit. It is inspired by the concepts of physical computing and the web of things. Physical interaction means that you can see, listen, touch, push or pull an object and it will react in some way. It means sensors and actuators, and some inteligent behaviour embedded in the objects. There objects are created with arduino, an open hardware project that can read sensors and control actuators and handles the physical interaction. It also means that the objects have some inteligent behaviour and are a sort of enhanced objects. For the interaction with web applications, these objects are equiped with an ethernet shield on top of arduino that talks to a google app engine application. The application handles the integration with other web applications and will enable the integration with twitter, facebook, blogs and other web sites. The phybo objects will be connected to social networks and websites. The instructions to create the objects are published under a creative commons license. Just follow the diy instructions and build your own objects. To connect your objects, notify any change, send any question or create new objects, send an e-mail to info@phybo.com. 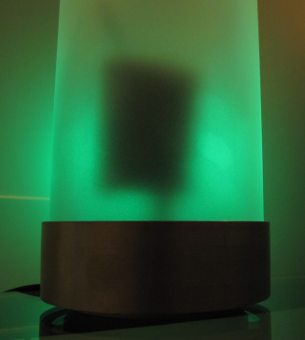 The first object that was created is a thermometer lamp, that you can see sending temperature data. creative commons attribution 2.5 Spain license.